pandit krishnarao shankar pandit ji chinchwadkar, is the one and only one hindustani classical singer who had brilliant taans, superb aalaps, splendid gamak, consolodate control over swars, and great talim from pt. shankar rao vishnu pandit,alongwith nissar hussain. KRSP hamare gwalior ke moti hai. dr ishwarchandra ramchandra chhatri bazar, lashkar, gwalior is one of the few disciples of pt. pandurang rao sitaram umdekar, to whome krishnarao shankar pandit ji had taught classical vocal. after death of pt pandurangrao sitaram umdekar’s death dr. ishwarchandra ramchandra karkare learned hindustani music from pt vishwanath buwa joshi, who was another disciple of pt. 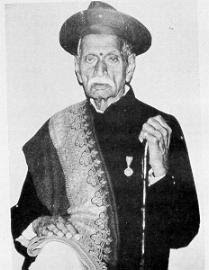 krishnarao shankar pandit. pandit ji was extraordanary but his contribution people doesn’t know. so nilesh ji i request you to bring his old beautiful bandish and tappa. dear purohitji, neelesh and meeta pandit have uploaded a few recordings of pandit krishnrav panditji . Pandit Krishnarao Shankar Pandit alongwith excellent performer he was a great scholar of music also. He had developed Swara-lipi to denote the “Cheez”. the lipi developed by him was taught to students of Gwalior tradition. Besides a great scholar of music tradition he was a person having a great vision about the indian classical music. To preserve the hindustani khayal gayan he opened music college, ofcourse by grace of Maharaja Madhavrao J. Shinde (Today popular as Scindia). I have no words to describe the prudence thoughts of Pt. Krishnarao Shankar Pandit, for continuing the old tradition in next generation Pt.KRSP allowed music companies to record the vast treasure of music, unlike many other artists who dint gave recordings of their sangeet.